Restonian: News blog from Reston, Virginia, the mauve-colored New Town (tm): Happy 45th/95th, Reston/Bob Simon! 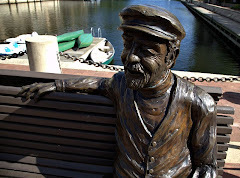 Don't forget this Saturday is a Very Special Founder's Day, during which Reston will celebrate its 45th anniversary of being carved out of the wilds of Northern Virginia by Bob Simon, who celebrates his 95th birthday that same day. Which is seriously awesome, considering he had the wherewithal to decamp to some fancy beachfront manse decades ago but instead has chosen to spend his golden years attending bizarre public hearings and advocating for simple solutions to complex problems. Reston Association President Robin Smyers said many people get excited about big anniversaries but she said Reston's anniversary coinciding with Simon's 95th birthday is an incredible milestone. "He still brings an energy and enthusiasm to the community that we should all be lucky to have if we're half his age," she said. Smyers said Simon is an inspiration and role model to the community and has shown that through his level of involvement and commitment, ensuring that Reston succeeds as a community. She said the principles Simon founded Reston on are still relevant and have not been diminished during the area's growth. "There's still the love of the community, the desire to always make us a better community," she said. Anyhoo, be sure to come to all the festivities, which at some point include a "Lake Anne-themed cake" (we're wondering if it'll be algae flavored with the full text of a DRB violation letter written in earth-toned frosting) and some fancy evening gala where attendees will receive the souvenir of Reston pictured above. We're not exactly sure what it is, but it looks like it would really bring an earth-toned, shag-carpeted room adorned with wood paneling and metallic wallpaper together quite nicely. Happy Birthday to Bob Simon and Reston.